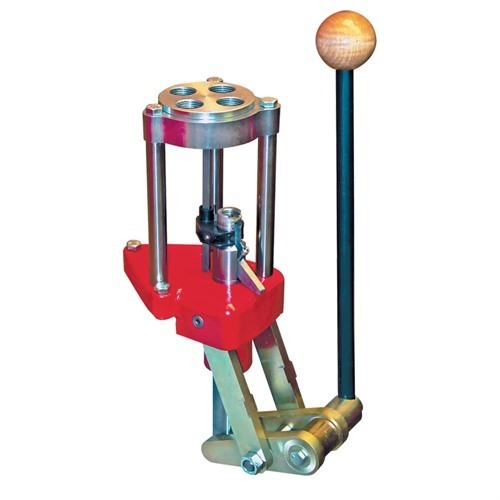 This press has all the features of the award-winning Turret Press with quality touches that make this the finest, most convenient press to own. The Classic Turret features the solid steel linkage of the Lee Classic Cast. Your first stroke of the hardwood gripped lever will convince you this is one, solid silky smooth press! The sturdy iron base shows its Classic Cast roots. The long stroke allows rifle cases over three inches long to be loaded using the automatic index. Deactivate the Auto-Index and cases over 4 inches can be loaded. The rigid cast iron frame supports the ram with over 12 square inches of area. The industry's largest ram is drilled completely through to dispense primers in an attached clear PVC tube. Every primer is caught--guaranteed. Instant change turrets are the same as the famous Lee Turret Press. The Classic Turret uses the Lee Lever Primer System (LPS) and the Lee Safety Prime tool makes priming on the press a delight. Dette trykk har alle funksjonene til den prisbelønte Turret trykk med kvalitet innslag som gjør dette fineste, mest praktiske pressen å eie. Klassisk dreieskiven har solid stål sammenhengen av Lee Classic kastet. Din første slag av løvtre grep spaken vil overbevise deg om dette er en solid silkeaktig glatt trykk! Solid jern base viser røttene klassiske Cast. Lange slag gjør rifle tilfeller over tre inches lang lastes ved bruk av automatisk indeksen. Deaktiver Auto-indeksen og tilfeller over 4 inches kan lastes. Stive støpejern rammen støtter ram med over 12 kvadrat inches av området. Bransjens største ram er boret helt gjennom for å dispensere primere i en tilknyttet klart PVC-rør. Alle primer er fanget - garantert. Instant endre tårn er den samme som den berømte Lee Turret trykk. Klassisk dreieskiven bruker Lee spaken Primer System (LPS) og verktøyet Lee sikkerhet Prime gjør grunning på trykk en fryd. My first and only press so far. I would only recommend based on certain idividual needs. Beginner press with multiple calibres to reload? Yes. Plinker? Yes. Moderate volume / pistol / semi-auto shooter? Yes. Precise / long range shooter? Maybe not??? Maybe get a different press for that? I reload .204 Ruger rifle, so do not use the auto indexing feature. Swap out turrets handy for loading more than one calibre, just buy more 4-hole turret rings. Can set one turret up soley for case prep, universal de-priming etc. Maybe include a bullet puller die in one of the holes if needed (I have the Hornady cam lock one in same ring as my three Redding dies: full length sizer, neck sizer and bullet seating). INSTANT change out of dies - just spin the turret ring around. The classic press is heavier and much better constructed than the basic turret press. I do not think the 3 and 4 hole turret rings are compatible / interchangeable ? The advertising is misleading -- primers do escape quite often sometimes, especially if the large or small primer cup holder is not inserted in the ram. The drilled ram and PVC pipe to collect the primers is an excellent idea though! Just that sometimes a primer will fall out of the slot before making it into the PVC pipe. The icluded disc shaped Lee primer holders are great, easily making 100 or more primers face the right way up. The problem is getting the primer out of the system and into the little cup in the ram. This is sometimes a frustrating step, and when the hopper gets very low on primers, the system always misfeeds. I ALWAYS have one or two primers left in the system that I eventually have to place into the ram by hand. They must get stuck because there are no primers above to push them down into the feeder. This is my first and only press, so I do not know if this is acceptable or normal, but because it has a rotating turret disc (very smooth movement by the way), the whole thing has a lot of play in it. The whole turret disc (and so the dies themselves!!) can wiggle / lift up and down about 1-2mm, and when the shellholder finally meets the bottom of the die it all becomes tight and solid. I wonder if this is good for precision / accuracy?? I do not have to set my dies up each time (I just spin the turret to the required die), but if not using the auto index feature, a regular single stage press may have been more appropriate for me. Maybe ideal for pistol / moderate volume / semi-auto rifle reloaders? Not long range shooter's choice? I bought my Lee Classic Turret Press figuring I'd upgrade at a later date if needed, but here it is 5 years later and it's still doing everything I need. It is ingeniously designed and its simplicity makes reloading a real pleasure. I hand prime, so my actual reloading is "pull the lever twice, set the bullet and pull 2 more times to get a round". Produsentnr. : 90064 734307900649 Dette trykk har alle funksjonene til den prisbelønte Turret trykk med kvalitet innslag som gjør dette fineste, mest praktiske pressen å eie. Klassisk dreieskiven har solid stål sammenhengen av Lee Classic kastet. Din første slag av løvtre grep spaken vil overbevise deg om dette er en solid silkeaktig glatt trykk! Solid jern base viser røttene klassiske Cast. Lange slag gjør rifle tilfeller over tre inches lang lastes ved bruk av automatisk indeksen. Deaktiver Auto-indeksen og tilfeller over 4 inches kan lastes. Stive støpejern rammen støtter ram med over 12 kvadrat inches av området. Bransjens største ram er boret helt gjennom for å dispensere primere i en tilknyttet klart PVC-rør. Alle primer er fanget - garantert. Instant endre tårn er den samme som den berømte Lee Turret trykk. Klassisk dreieskiven bruker Lee spaken Primer System (LPS) og verktøyet Lee sikkerhet Prime gjør grunning på trykk en fryd.